Innovation is front and centre of Rob Baan’s philosophy for growing a healthy product. NINETY per cent of product is sold in Europe. Chat to Netherlands’ farmers and Rob Baan is considered the Steve Jobs of horticulture, his innovation comparable to that of the Apple founder. And among the Dutch public, Rob’s face is well known, given his outspoken views on the need to eat more vegetables and the economic opportunities of turning health into an economy, to make the Netherlands a “green farmacy”. “We’ve forgotten the why of horticulture,” Rob told The Weekly Times during a recent visit to his Koppert Cress headquarters at Monster, on the horticultural hub of the west coast of Holland. Rob studied agriculture and worked for global agribusiness firm Syngenta before taking over Koppert Cress in 2002, when the company was worth two million euros and had a range of four products. He has since transformed the micro-green punnet business, making 65 products and with a further 50 waiting for release from research and development. Koppert Cress is now worth 33 million euros (A$53.4 million) and is growing by 10 per cent every year. Seed is produced at sites around the world for Koppert Cress, from China to Peru and grown out in The Netherlands across four sites totalling 10 hectares, with 260 employees. The 62-year-old father of four said the starting point for any one of his products was taste, and he travelled the world in search of new flavours. “Nature is so rich and our ancestors knew what to eat. There are 10,000 plants not eaten today that we once ate,” he said. Visit the Koppert Cress headquarters and it’s easy to see why comparisons are often drawn to Willy Wonker’s fan-tastical creation. A taste garden offers visitors an astonishing array of tongue teasers, from a yellow flower that is like licking a battery, a green leaf that somehow manages to be a pleasant combination of Vicks Vapor Rub and peppermint, and another that tastes of hazelnut. A cafe offers free meals to staff, all based on the concept of eating 250g of vegetables a day, or 80 per cent of a diet, with the company’s product the hero of many dishes. The headquarters also boasts a kitchen offering world’s-best “toys for chefs”, from 3D food printers to a Molteni oven and stove the size of a family car and barbecues no Australian backyard would recognise. Rob’s son Stijn agreed, adding “if we sell cress over the phone it doesn’t work, so we want chefs to visit us, play here, get excited, take photos and get others interested, including in the food services industry”. 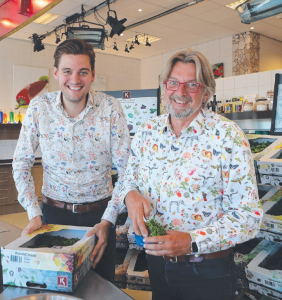 “If you have a niche product selling wholesale no one is interested in five boxes of cress, but if you go to Michelin star chefs who then want Koppert Cress product it means we don’t call distributors, they call us,” Stijn said. This unique business model of chef-led demand means Koppert Cress products are used in 70,000 restaurants a week, with most of their product marketed in a 50km radius through distributors, subsequently 90 per cent is sold in Europe. “The area around Monster is a logistical hub for horticulture and I make optimal use of the transport in the region. I sell to distributors and I don’t care or mind who they sell to,” Rob said. Innovation extends to Koppert Cress’s greenhouse technology. With production yearround, the fastest growing product is radish sprouts at five days, with the slowest salicornia or sea asparagus taking six weeks. Rob said tap water was used in spray irrigation in all greenhouses as it was food safe and Holland had no water shortages. His greater concern was sustainable energy use and for that reason a tour of the Monster facility is like touring a power plant, with more investment below ground than above. In a mind-boggling engineering feat initiated two years ago, heat from greenhouses is captured in summer and stored underground at 170 metres between a layer of clay and sand in an aquifer thermal energy storage system for use in winter. In addition, artesian water is brought to the surface in summer for use in cooling, all to ensure greenhouses are maintained at an 18-25C level through hot summers and snowy winters. Koppert Cress also uses green energy and has solar panels — not for electricity but for heat capture. Next year Rob hopes to tap into the Netherland’s growing demand for geothermal energy. Because winters are also dark, greenhouses have been made with hammered glass, which acts like diamonds or small pyramids to deflect as much light as possible to plants and avoid shadows. LED lights are also used on the blue/red spectrum, which Rob said added more flavour to plants. Greenhouses were initially built to stack five levels of production, but the Baan family found it was cheaper to build new greenhouses, “but if that changes we are stack ready for the future”. Once plants are ready for sale they are mechanically taken from greenhouses and placed in cool storage at 4-7C to halt growth and then transported at the same temperature. Rob said every aspect of production maximised plant flavour and quality, which underscores his broader food philosophy. In the foyer of Koppert Cress headquarters there’s an unpaid Dutch Government fine that was issued to Rob after he publicly said broccoli was healthy. The highly regulated Dutch system makes it illegal to state claims that are not backed by science and as such Koppert Cress financially supports several academic studies on the nutritional benefits of vegetables. “My father was happy to go to jail and not pay the fine to make a very public statement about the need for a healthy society,” Stijn said. Article written by Sarah Hudson for The Weekly Times (Australia). duurzaam, duurzaamheid, eten, food, fun, gezondheid, groente, groenten, health, interview, koppert cress, Media, Rob & Bob, Rob Baan, The Weekly Times, tuinbouw, voeding, westland.